Edition of 1612 of which 300 copies are signed 1-300; 26 are signed A-Z as artist's proofs; three sets are signed as progressives; two are signed as a dedication copies. October 11, 1989 9 colors. This is the first poster on which I used fade-resistant inks. 15" x 24"
Children do get sick. They get sick and they get hurt and they die. You need special people to care for children. My sister Lisa is a nurse at Alta Bates Hospital, and she takes care of newborn babies. Some of them make it and some of them don't. 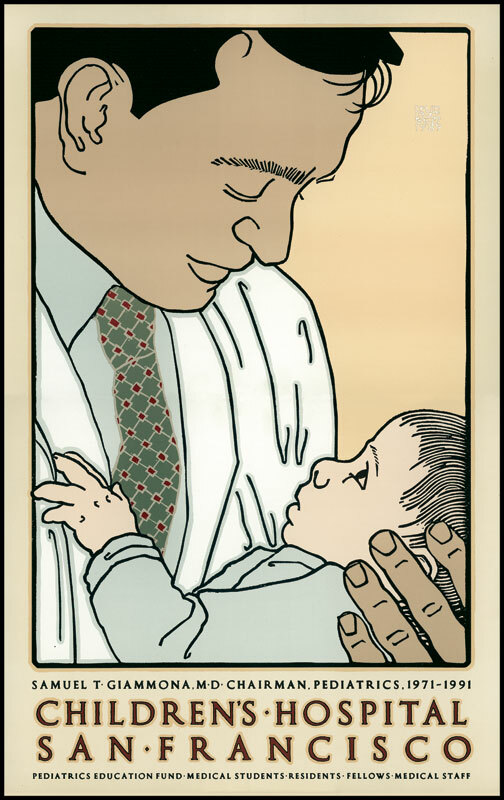 The people in the San Francisco Children's Hospital poster are Dr. Giammona, Chairman of the Department of Pediatrics, and Nathan Volat, son of a resident physician. Little Nathan looks somewhat apprehensive as Dr. Giammona poses holding him and I swiftly draw and take a few photos as an aide memoire. You'd be scared too if you were just a little baby in a hospital.